Sylvia Nichols Allen snuggles under a light-blue afghan on her leather recliner, offering a stark contrast with the photo of herself on the wall overhead. In the portrait, taken just before Christmas last year in her Essex home, Allen, 64, is standing with her husband of 20 years, Michel, 67. Waves of strawberry-blond hair frame her grinning face. Now Allen is 30 pounds lighter. Despite the midsummer heat, she’s dressed for winter in gray corduroy pants and two shirts. A pink cloth covers her bare head. On January 2, a doctor diagnosed Allen with stage IV nonsmoker’s lung cancer, just days after a CAT scan revealed several small tumors on her lungs. Quickly, the cancer metastasized to her spine and brain. 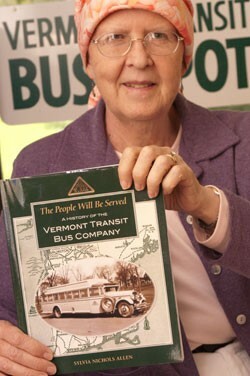 That isn’t stopping Allen from talking about her first book: The People Will Be Served: A History of the Vermont Transit Bus Company. Self-published via Amazon’s CreateSpace, it’s the only complete written history of VTC, a public transportation staple from 1929 to 2008, when Greyhound absorbed it. She was unsure she would live to see The People Will Be Served. Allen survived breast cancer twice in 2000, undergoing two mastectomies, but lung cancer is harder, she notes. Instead of offering a prognosis, doctors told her she would need a debilitating treatment every three weeks for the rest of her life. She has no appetite and little strength, but feels no pain. Allen says she harbored the desire to write a book over the 25 years that she served as the Harwood Union High School librarian, but always imagined it would be fiction. After she retired in 2005, Allen started her own business, Senior Companion Services, which offered assistance and company to the elderly. And that’s how, in 2008, she met Charlie Irish and finally found a subject for her book. “I felt that somebody needed to tell a history of the company, because, in a few years, everyone would forget about it,” Allen says. “So I started bringing a notepad and pen when I went to see Charlie. From 2008 to 2010, Allen gathered information on VTC founder William S. Appleyard, whom she applauds for fostering a “culture of family” in his company. She also sifted through materials at the Vermont Historical Society and conducted nearly 20 extensive interviews with past VTC employees, including some who worked there in the early years. Allen also spent hours and hours in the Williston basement of Ken Bessette Jr., whose father was a VTC driver for 42 years and a tour guide for eight. Bessette has all the scrapbooks and notebooks filled with his father’s writings about VTC. Those include memories of the company he relayed in a regular column, “I Remember When…,” that he wrote for the Williston Whistle (now the Williston Observer) until his death in 1995. Ken Bessette Sr. never finished high school, and “his spelling and grammar were atrocious,” Allen says, but he was a master storyteller — so much so that Allen filled the last chapter of her book with Bessette’s lively, engaging anecdotes about VTC. Now Allen wants to help Ken Bessette Jr. collect his father’s works and donate them to the Vermont Historical Society. Allen says she has to look ahead. “I try not to think about it a whole lot,” she says of her illness. “I’m most dismayed by watching my family and husband go through all of this … but I’m not afraid of dying.